Dieses umfassende Werk liefert einen Überblick ueber das gesamte Spektrum des Denkens in der Psychologie, von der Antike bis zur Gegenwart. 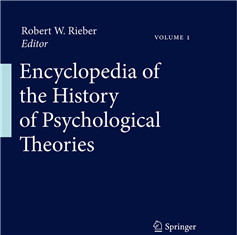 This work will survey the entire range of thinking in psychology, from ancient times to the present, encompassing philosophies and theories of mind that pre-date our modern conception of psychology as a science, and extending to the current findings of neuroscience. It will set the theories into their historical context and cross-reference key influences, such as Darwin’s on Freud. Fifteen hundred entries will comprise key figures, theoretical concepts, false theories, historical events, and seminal writings. International in scope, this project will involve history of psychology experts from around the world and the coverage of topics will be set in global context. The aim will be to provide a reference work of more depth than discussions that are currently available in textbooks, with the ability to connect to a multitude of relevant topics. This work will provide a picture of psychology as it has emerged into the present time and position it among other related fields such as anthropology, sociology, philosophy, and medicine. Dieser Beitrag wurde am 04. Mai 2012 von Oliver Obst in e-Books veröffentlicht. Schlagworte: e-Books, Psychologie, Springer.